For weekday meals I have been known to take short cuts, like starting with a canned soup. Usually I boost the “tinned” flavor with some fresh seafood, but my daughter, Eilene, objects—“But fresh is so much better!” I have created a monster. 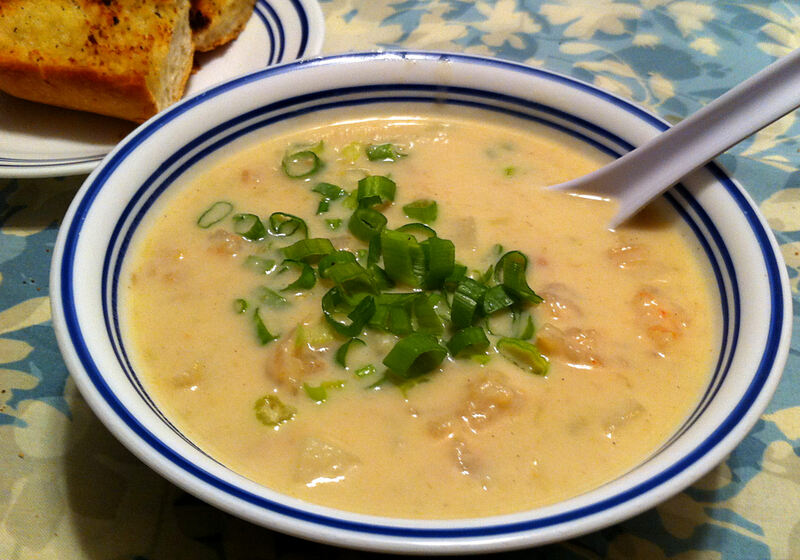 Trying to replicate the creamy texture and soft vegetables of a good canned clam chowder proved to be a challenge. The first time I made this soup I tried to cook the second set of potatoes in the thick, blended soup. This proved to be messy and dangerous. The thick stock bubbled and splattered over the lid, the stove, and my hands as I tried to stir the pot. Using two pots proved to be both necessary and much quicker as well. Cooking the two part of the soup at the same time cut the cooking time in half. I now had a weekday, fresh soup which took just little more time than starting from canned. Note: It is important to use a starchy potato, like a Russet, to thicken your soup. I used two Russet potatoes in this soup, but if you wish you may use white, red or Yukon Gold potatoes as your second potato. Whether you peel the potatoes or not is a personal choice. I peel the Russet potatoes, but if you are using the waxy potatoes you may leave the skins on for the vitamins and rustic appearance. After Dinner Note: I generally make enough soup that I can feed my family of three with a serving or two left over for lunches. Jan says this soup is excellent cold the next day. 1. Melt butter over a medium high heat in a large soup pot. Sauté the onions and half of the celery with the salt until they are just starting to pick up some color, about five minutes. 2. Add the leeks and continue sautéing for three minutes more. 3. Pull the vegetables to the sides of the pot and add the garlic to the hole in the center. Sauté until the garlic is fragrant, about one minute, and then stir in the vegetables. 4. Add half of the Russet potatoes and white pepper. Cook for two more minutes to warm up the potatoes. 5. Stir in the clam juice, the liquid from the cans of minced clams, and half a jar of water (half a cup). Tip: Do not add the minced clam meat at this time or it will become very rubbery. 6. Bring the pot to a boil, cover, reduce heat and simmer for 15 minutes. 7. While the soup stock is simmering, put the shrimp shells into a second medium pot with one and a half cups of water. 8. Bring the pot to a boil, reduce the heat, cover and simmer for five minutes. 9. Strain out the shells and return the shrimp stock to the medium pot. 10. Add the rest of the celery and potatoes to the pot and simmer for 7-10 minutes, until the potatoes are tender. 11. Briefly process the soup base in the large pot in a standing blender until smooth. Tip: Use some of the liquid from the second pot to rinse out the blender jar. 12. Return the soup base to the large pot and add the clams, shrimp, and the contents of the smaller pot. Tip: Leave the shrimp whole or, I prefer to, chop them into 2-3 pieces. 13. Simmer the soup for 2-3 more minutes to cook the shrimp and bring the soup up to heat. 14. Stir in the cream and continue heating, stirring, until the soup has fully reheated, about two minutes. 15. Serve in individual bowls and garnish with some green onion. Tip: You may serve this soup with a small green salad, oyster crackers, or crusty garlic bread on the side.